Tom Hardy has received his Commander of the Most Excellent Order of British Empire (CBE) from Prince Charles at Buckingham Palace. The 41-year-old actor was beaming with glory during this event and refused to talk to the press, basking in the glory uninterrupted. He was honored by the Prince of Wales alongside Ken Follet, known for her Century trilogy, and Lucy Worsley, TV historian presenting on BBC. Hardy’s CBE was announced earlier this year but the impressive honor for his services to drama was given to him last week. Tom Hardy is now a member of the Order of British Empire. Hardy was honored alongside Kenny Dalglish, Jermain Defoe and Jo Malone. The recognition acknowledges Tom’s meteoric rise thanks to countless blockbusters like Venom, Mad Max: Fury Road, Legend, Inception, Dunkirk and The Dark Night. Tom is not just a talented, handsome man but he’s also willing to be a complete and utter weirdo for the sake of a great performance and Hollywood recognized that. 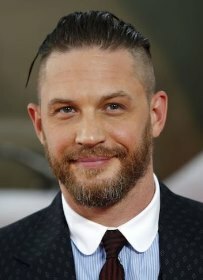 Hardy’s biggest Hollywood accolade was an Oscar nomination in 2016 for his role in The Revenant. He also received high praise, including the British Independent Spirit Award, for his role in Bronson in 2008. Hardy is a personal friend of the royal family and reportedly shared a stealth cameo with both Harry and William in Star Wars: The Last Jedi that wound up being cut before the film made it to theaters. Hardy became an ambassador for The Prince’s Trust in 2012 and he also attended Prince Harry’s wedding to Meghan Markle in May this year and describes their friendship as “deeply private”. He is married to an actress Charlotte Riley. Tom has come a long way. He has been sober for 13 years after previously claiming he would sell his mother for a rock of crack. He talks openly about his battle with addiction and staying sober to inspire others to do the same.